Print-quality photography is available for download. For special logo requests, please reach out to us at [email protected]. This travel expertise site is charmed by Portland's boutique hotels, Pomegranate Inn and The Danforth, for their traditional elegance and with modern amenities. When staying in Portland, Maine, this national city guide easily chooses The Danforth; the "newly opened boutique gem, a converted mansion in the West End neighborhood (which is sneakily becoming the coolest part of town)". This local Cape Cod publication praises the Lark properties of Martha's Vineyard; The Christopher, The Richard, and The Sydney, as must-see boutique inns, for both their exquisite design and their endearing connection to honoring the family that manages the properties. Portsmouth, New Hampshire, provides the picturesque backdrop for a romantic honeymoon getaway, and this bridal magazine advises staying at the boutique hotel, The Hotel Portsmouth. Connoisseur's of all things classic New England, the editor's of this magazine picked both The Attwater and Gilded for best of Newport stays, delighting in the tapas-style breakfast and the uniquely charming decor. In a conversation about the pastel-colored interiors the design world is obsessing over, this travel expertise notes the Pomegranate Inn's soft-pink accents and hand painted wall murals. This local Cape Cod newspaper recounts a night of culinary excellence hosted by The Coonamessett, which showcased the boutique hotel's proficiency in flawless execution and familial comfort. This dream vacation guide reminisces Whitehall's "traditional ambiance" and "contemporary amenities", making for a charming and luxurious getaway in Camden, Maine. New England travel and lifestyle magazine nominates multiple Lark Hotels properties for their Best Boutique Hotels in New England award. Perched on one of the best beaches in New England, Blue Inn is named a "terrific boutique hotel" by this professional travel guide. This international airline's magazine praises the nature-inspired and eco-friendly interiors of Field Guide, bringing the stunning Vermont wilderness indoors. This Boston publication finds the quintessential New England winter weekend at Field Guide, the "unique and cozy lodge-style hotel" nestled in the picturesque ski-town of Stowe, Vermont. An expert on all things hospitality, this publication notes Lark Hotels' recent acquisition of The Danforth, adding to Larks' list of Maine and New England boutique hotel properties. This trusted publication in the design, boutique, and lifestyle space notes the newest addition to Lark's portfolio; The Danforth, an 1823 mansion-turned-inn. This design and lifestyle publication recognizes The Attwater as, "the embodiment of Newport’s optimistic and lively nautical spirit." New England winters aren't going anywhere, but Lark Hotels' Hot and Hygge packages make the snowy winter winds something to look forward to, from Field Guide in the Vermont mountains to the rocky Maine coast at Captain Fairfield Inn. This respected lifestyle company recommends both The Attwater and Gilded for a picturesque getaway to the seaside winter wonderland of Newport, RI. Once the home of a former sea captain, the contemporary and nautical 76 Main on Nantucket is highlighted by Wherever Family as the quintessential luxury stay for a family trip in New England. The official inflight magazine of Southwest Airlines heads straight down the cobblestone streets of Salem to The Hotel Salem, naming it a "New England gem." This well-regarded travel publication advises The Downtowner, with it's boutique hotel features and central location on the main street of Saratoga Springs, as an ideal stay for a girls' trip. This Boston newspaper turns to multiple Lark Hotels properties, particularly Field Guide, when in search of that perfectly Instagrammable stay, and your followers' envy. This travel guide awards AWOL, a boutique hotel in Provincetown, MA that captures modern coastal simplicity, as the best seasonal hotel of 2018. An expert of all things New England, this writer relished in the quintessential holiday spirit in the cozy and carefully curated Field Guide, Lark's boutique hotel in Stowe, Vermont. This daily newspaper was looking for unforgettable winter escapes from the city, and found it's answer at The Downtowner in Saratoga Springs. This regional magazine explores the newly renovated Eli's Tavern at The Coonamessett, where "a tradition of culinary excellence continues with an enticingly refreshed menu." This regional lifestyle magazine gets in the holiday spirit in Kennebunkport, ME, visiting for the Christmas Prelude but staying for a night at the Captain Fairfield Inn. This Boston newspaper turns a holiday shopping trip into a lovely stay-cation at the Ale House Inn, located among the shops of downtown Portsmouth, NH. This New York based lifestyle magazine trusts that when traveling to Cape Cod, a stay at The Coonamessett provides "whimsical maritime décor" along with its spirited history. This trusted international news source and magazine recommends Lark Hotels' Black Friday special as a travel deal not to be missed. This online travel blog and affiliate of TripAdvisor recommends Lark Hotels' Cyber Monday deal as one of the best in 2018. This news magazine goes directly to the source when craving fresh fish, and luckily this restaurant in the Olde Marco Shops is directly adjacent to the Olde Marco Inn. This British news publication turns to The Hotel Salem for a contemporary, stylish, and comfortable boutique hotel experience. A Singaporian newspaper picked up this feature about Instagram's effects on the travel industry, with a mention of Lark Hotels' Instagram scavenger hunt at Gilded. Lark Hotels' signature Instagram Scavenger Hunt at Gilded was mentioned in this national feature about social media's impact on travel. This TV Travel Host finds solace from the spooky streets of Salem at The Merchant, which "mixes modern, fun, vibrant character with the building’s old school charm." This daily newspaper turns to the Merchant in Salem for it's rich historical legacy, and the opportunity to stay in the building that once housed President Washington. Parents-to-be can indulge in some serious relaxation in the oceanside town of Kennebunkport, ME, thanks to the Babymoon special at the Captain Fairfield Inn. October 10, 2018 @ Lark Hotels | The Roof Coming Soon! This seasoned food writer recommends The Roof in Salem for a local haunt that rises above the town's October spookiness. The Hotel Salem's rooftop bar provides the perfect perch to watch all of Salem, MA's, spooky October happenings. Lark Hotels properties throughout New England, including 21 Broad, 76 Main, Field Guide, The Attwater, The Hotel Portsmouth, and Whitehall, were named among Top Hotels in New England in the 2018 "Reader's Choice Awards." This national magazine admires the fresh makeover at this elegant and cozy coastal bed and breakfast, JD House. A quintessential New England tour of fall foliage includes a stay at the Hotel Portsmouth, an inn-style hotel that "screams Americana." October 5, 2018 @ Lark Hotels | The Roof Coming Soon! This national magazine highlights Salem's first-ever rooftop bar, The Roof, as a culinary destination for both locals and visitors. October 5, 2018 @ Counter | Lark Hotels | The Hotel Salem | The Roof Coming Soon! This national dining site included The Hotel Salem's restaurants, The Roof and Counter among Salem's top dining destinations for October and beyond. This regional lifestyle site highlighted Camden and Whitehall as some of the top spots for fall foliage sightings in New England. This Boston-based site calls Field Guide "the best of both worlds—it’s nestled in the heart of Stowe, and is still minutes from ski slopes and hiking trails." "AWOL's rooms combine luxury, comfort, and a unique simplicity," says this Northeast-based airline blog. A list of the nation's most beautiful towns includes Camden, Maine, with Whitehall noted as the top place to stay during a visit. NESN's famous "Dining Playbook" series took a trip to The Hotel Salem's onsite restaurants, Counter and The Roof, highlighting everything from the Counter Burger to the Braised Pork Tacos. A fall travel write-up in this luxury glossy calls newly-opened Edgartown property, The Richard, "elegant and playfully regal." This local college newspaper included The Downtowner's new look among Saratoga Springs' most exciting summer business openings. This industry trade calls AWOL an "upscale marshland mecca" in this feature about the hotel's recent summer opening. This chic interior design site calls AWOL the "newest hotel on our travel bucket list." After a summer full of openings - AWOL, The Coonamessett, The Richard and The Sydney - this Boston-based newspaper highlights the continued expansion of Lark Hotels and shines a light on the newest hotel additions. This industry trade magazine highlights Lark Hotels and CEO Rob Blood as part of its "Design Disruptors" feature in the September issue. September 2018 @ The Hotel Salem | The Roof Coming Soon! The Roof at The Hotel Salem is praised for its "creative drinks, tasty snacks, and panoramic views of the Witch City" in this northshore-focused magazine. This national dining site included Lark Hotels' newest property, The Downtowner in Saratoga Springs, among wallet-friendly fall getaways along the Northeast. This design-focused site digs deep into the details that make AWOL a "coastal-cool" destination, perfectly timed to shake-up the Provincetown hotel scene. This hotel trade publication announces the debut of AWOL, now open in Provincetown, MA. The Hotel Portsmouth is named "a charming bed and breakfast that perfectly mixes New England old-world style with new-world amenities" in this guide to New England leaf peeping. Just in time for an end-of-summer trip to the Cape, AWOL brings "a shot of fresh energy" to Provincetown. A town that's "Less crowded than the Hamptons, and more accessible than neighboring Nantucket," this national lifestyle site recommends stays at The Christopher, The Sydney and The Richard during a weekend trip to Edgartown. 21 Broad is included among the world's top budget-friendly beach resorts according to this national lifestyle magazine. Lark Hotels' newly expanded Edgartown hotel, The Sydney, and brand new sister property, The Richard, were included in this national travel site's list of the top new and noteworthy to-dos on Martha's Vineyard. All a quick drive away from Boston, this piece selects The Merchant, The Hotel Salem and Blue - Inn on the Beach as places for "effortless overnighters" when venturing away from the city. A slideshow in this regional business publication highlights The Downtowner's new look. Lark Hotels transforms the previous Inn at the Moors into AWOL, now open in Provincetown. This luxury lifestyle glossy spotlights Lark Hotels' newly debuted Edgartown projects, The Sydney and The Richard, alongside sister property, The Christopher, and Oak Bluffs hotel, Summercamp. The Downtowner's opening in the heart of Saratoga Springs is spotlighted in this round-up of national travel news. "Location, location, location" is just part of The Downtowner's newly redesigned charm according to this local lifestyle piece. The Downtowner, Lark Hotels' first New York property, is highlighted in this local web feature. The Downtowner's new, "gallery-like space" is highlighted in this daily newspaper feature. This local feature highlights The Downtowner's debut in downtown Saratoga. The Hotel Portsmouth's blend of "Victorian courtliness with modern crispness" make it an ideal spot for romance according to this piece. Blue -- Inn on the Beach's "spectacular sunset views" make it a must-try getaway in August according to this national travel site. Blue claims the Reader's Choice award for Best Bed & Breakfast in the magazine's annual Best Of The North Shore issue. The Hotel Salem's onsite restaurant, Counter, was named "Best Dessert: Editor's Choice" in the 2018 Best of the North Shore Awards. The newly-revamped Coonamessett was selected as one of four top coastal vacation spots by this national travel site. The Downtowner debuts in Saratoga Springs, paying homage to the local community and the hotel's past as a retro motor lodge. The Downtowner's new look is the focus of this hotel industry-facing write-up. This design-focused post highlights The Downtowner's recent launch in Saratoga Springs. A "fresh take on the vintage motor lodge," The Downtowner debuts in Saratoga Springs. For those shorter getaways, this online magazine calls Blue "your best bet," describing it as an upscale 13-room inn located right on the beach." The Attwater is included in this insiders' guide to Newport. Blue - Inn on the Beach is the perfect New England staycation destination "for anyone whose staycation goals include a lot of time on the beach." This article highlights Rachel Reider Interiors' redesign of the Richard Hotel, as well as the expansion of the nearby Sydney Hotel. "The distinctive design pays homage to the building’s coastal New England heritage, with classic elements like a front porch and the original bones of a 19th century Greek Revival captain’s home." The opening of The Richard is included in this roundup of "buzziest happenings in the world of travel." This article highlights the opening of the newly renovated Richard Hotel. This piece explores the design details of the newly opened Richard in Edgartown. "At 76 Main, the interior design takes a more contemporary turn, with bold patterns and nods to the history of New England. Plus, the boutique hotel is mere steps from the shops and restaurants of the island’s main drag." Local reviewer visited The Coonamessett's onsite restaurant, Eli's Tavern, for fare that puts "a creative twist on timeless New England classics." Summercamp, with its "rustic touches" and "modern draws," is highlighted in this Martha's Vineyard travel guide. The Blue Door Group's newly renovated JD House, "a modern take on a sea captain’s quarters, with fireplaces and Persian rugs," is highlighted in this Mendocino County travel guide. The Christopher and The Richard's unexpected, modern interior designs are highlighted in this feature on stunning accommodations around the Cape and Islands. The Hotel Salem is among the best places to stay in Massachusetts this summer. Whitehall is included in this roundup of travel ideas timed around Mother's Day. Plum Island and Blue - Inn on the Beach are included in this roundup of the top summer travel destinations that aren't overrun with tourists. May 8, 2018 @ Counter | The Hotel Salem | The Roof Coming Soon! The Hotel Salem's two onsite restaurants, Counter and The Roof, are highlighted in this guide to the top New England culinary travel destinations. The Hotel Salem was named Massachusetts' Best New Hotel in Yankee Magazine's annual Best of New England issue. The Attwater was named Rhode Island's best Boutique Hotel in Yankee Magazine's annual Best of New England issue. Field Guide was named Vermont's Best Boutique Hotel in Yankee Magazine's annual Best of New England issue. Whitehall was named Maine's Best Boutique Hotel in Yankee Magazine's 2018 Best of New England issue. The "rustic" Ale House Inn is included in this guide to the best beer vacation destinations in America. This article calls Blue one of the best seaside inns in the country. This article calls Salem one of the best small towns to visit in spring, and recommends the Hotel Salem as where to stay. This piece covers Lark Hotels' expansion into Martha's Vineyard with the renovation of The Sydney and the addition of The Richard. The Hotel Salem is included in this roundup of the top spring break destinations for adults. Blue is included in this spread on the top 50 secret places to visit around the world. March 2018 @ Counter | The Hotel Salem | The Roof Coming Soon! This piece touts how The Hotel Salem, Counter, and The Roof are making Salem the chicest new travel destination. This article highlights the Hotel Salem's "mid-century modern design layered with furnishings, motifs and a bold colour palette inspired from New England’s 1950s and 60s department stores." Can't get away for Valentines Day? New England Living recommends whisking "your love away to Plum Island" where you can celebrate love all February with a package deal at Blue - Inn on the Beach that includes a " book of love poems, homemade sweets and, of course, bubbly." The Merchant is included in this piece on hotels in which President George Washington once slept. "Exposed wood beams original to the [Field Guide] and in-room fireplaces, as well as bird wallpaper, antlers and trail-map art, help guests connect with nature outside their door, even when snuggling up in front of a roaring fire after a day on the ski slopes." The Hotel Salem and Ale House Inn are included in this list of hard-to-get reservations for summer New England travel. The launch of The Hotel Salem is featured in the "Openings" section. Counter's opening is highlighted in this "Tables" column. Lark Hotels events coordinator Maggie Hinman comments on this year's wedding trends. Counter's design, menu, and cocktail program are highlighted in this article on the restaurant's opening. 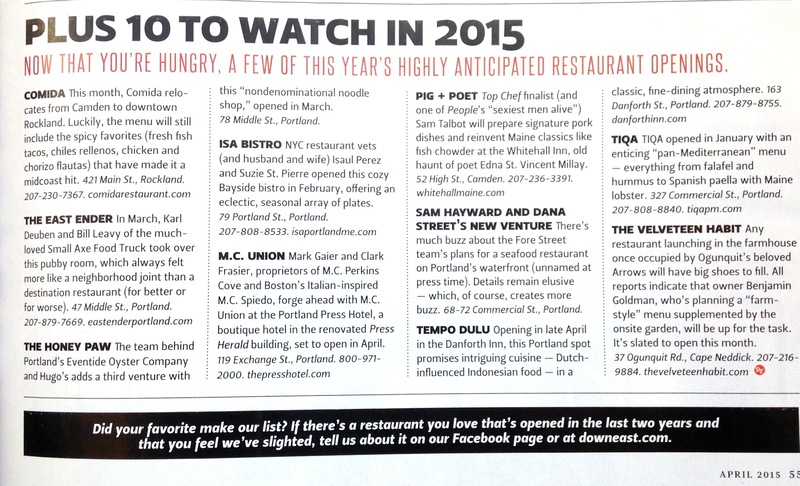 Counter's anticipated opening menu is highlighted in this piece. This article highlights the opening of Counter, with its "seasonal, ingredient-focused food with a nostalgic feel at The Hotel Salem." Martha's Vineyard and Summercamp are included in this roundup of the best islands off the coast of the United States. 76 Main is highlighted in this piece on design-forward hotel lobbies, along with Director of Design Rachel Reider's tips to re-create the look. Field Guide is included in this story on the perfect Stowe, Vermont ski getaway. "There's no way around it, The Hotel Salem is just cool. From the hip mid-century decor to its location along the pedestrian mall in downtown Salem, it's a must-visit for both travelers and locals." Lark Hotels Executive Chef Justin Perdue teamed up with Lark Fine Foods to create a custom "Double Lark" cookie. The Hotel Salem is included in this roundup of new venues with meeting spaces across the country. The Hotel Salem is included in this list of the top travel destinations across the United States for 2018. The Merchant's original iron hearth is included in this roundup of the best hotel fireplaces around the country. The opening of The Hotel Salem is highlighted in this weekly "Here, There, and Everywhere" column. This article describes "the peace and solitude that can be found" when exploring Maine in December and describes Captain Fairfield Inn as not only being comfortable but as having "beautifully decorated guest rooms and public spaces maintaining many of the Federal-style mansion’s historic detail." Field Guide is one of "10 effortlessly elegant hotels offer[ing] low-key luxury to counterbalance the high-tech stress of modern life." Field Guide is recommended in this piece on affordable weekend ski trips around the country. Field Guide is highlighted in this piece on the top winter getaways around America. The Hotel Portsmouth, Captain Fairfield Inn, and The Hotel Salem are among several Lark properties accessible by public transportation, perfect for an environmentally sustainable getaway. The opening of The Hotel Salem is highlighted in this column on Salem community news. The Hotel Salem and Ale House Inn are included in this piece on New England hotels that are perfect for a late-fall getaway. Take a look around The Hotel Salem, "an all-seasons destination inspired by building’s retail roots." This article highlights design of the newly opened Hotel Salem. This article explores Lark Hotels Director of Design Rachel Reider's approach to designing each property with a unique sense of place: "Rachel Reider works to reimagine classic, often historic, spaces into modern hotels that pay homage to the area’s deep roots, calling on décor from custom designers, retail stores, and online resources to create distinctly different, one-of-a-kind venues different from both other Lark properties and from other hotels in the respective areas." This article highlights the opening of the Hotel Salem: "Paying homage to its roots as a high-end clothing anchor store, the hotel’s design is a mix of mid-century modern decor and vintage, retail-inspired touches that embrace its past." This article explores the midcentury design of the newly launched Hotel Salem. Six Vermont properties, including Field Guide, were among the top 40 hotels in New England according to Conde Nast Traveler's Reader's Choice Awards. Field Guide is in the lead of the top places to stay in Stowe, Vermont. Field Guide and Picnic Social take the lead in this spread on budget-friendly ski destinations around the world. The article highlights "the traditional lodge look with mid-century touches, playful nods to nature, as well as signature pops of color in zingy green, orange, and purple." Kennebunkport and Captain Fairfield Inn are included in this list of the top places to travel in December. This article highlights the top hotels around New England, including 76 Main at #1, according to Condé Nast Traveler's recent Readers' Choice awards. The Merchant is included in this piece on Salem as an ideal year-round travel destination. The Merchant and The Hotel Salem are top destinations in Salem, one of New England’s most popular historic cities. The Merchant is a popular destination in Salem during Halloween. This Salem travel guide describes The Merchant as "an 11-room property that feels modern but still grips on to its old-world panache by retaining the original woodwork and other subtle flourishes of past." This article highlights regional winners in Condé Nast Traveler's Readers' Choice "Top Hotels in New England" list, including 76 Main at #1. Six Lark Hotels properties were voted "Top Hotels in New England: Readers' Choice Awards 2017," including 76 Main in the #1 spot. The Pomegranate Inn's Portland Fall Getaway Deal is highlighted in this travel deals column. Lark Hotels properties including The Hotel Portsmouth, Captain Fairfield Inn, Field Guide, and The Merchant are included in this New England fall getaway guide. Director of Hotels Meg Butcher weighs in on the evolution of in-room phones in hotels: "At check-in, we like to make the personal connection, get to know our guests' needs, and we set them up with our insiders’ perspective on the ‘must-dos’ while they’re with us. They will always know how to get in touch with us." The Christopher is called "a fresh addition to a saturated bed-and-breakfast market on Martha’s Vineyard" in this Check In column review. October / November 2017 @ Counter | Lark Hotels | The Hotel Salem | The Roof Coming Soon! This article gives a sneak peek behind the design of The Hotel Salem, The Roof, and Counter. The Merchant and The Hotel Salem are highlighted in this piece on visiting historic Salem during the Halloween season. Lark Hotels CEO Rob Blood is interviewed in this feature on different approaches to hotel development. This Q&A with CEO Rob Blood explores Lark Hotels' thoughtful approach to growth. Whitehall's "Bee's Tea Camden Sailing Package" is the perfect way to kick off fall in style. Field Guide is highlighted in this story about New England’s best spots to see fall foliage. Lark CEO Rob Blood shares his top Northeast restaurant recommendations in this annual list of "Where in the World to Eat." 21 Broad and 76 Main are top places to stay on Nantucket. Year-round, "the island of Nantucket is one of New England’s premier bucket-list destinations. Beaches, quiet beauty, great shopping, delicious food — it’s all here on this tiny Massachusetts island. " The Hotel Portsmouth, "which screams Americana by design and is within walking distance to the town’s fabulous restaurants, old-school coffee shops, and craft breweries" is recommended as the place to stay in New Hampshire in this state-by-state guide to New England foliage peeping. Summercamp is included in this spread on golf-based travel through Cape Cod and Martha's Vineyard. The September/October issue includes The Merchant in this Salem travel spread. Scott Kearnan calls The Merchant an "intimate inn-scale property with the plush amenities and sophisticated style of a much larger hotel," and previews The Hotel Salem in this write-up on Salem as a hip, LGBT-friendly travel destination. Whitehall and Pig + Poet are included in this New England style travel guide. Lark Hotels Executive Chef Justin Perdue discusses his life in Stowe in this fun "10 Questions" interview. The opening of the Hotel Salem is included in this roundup of the buzziest happenings in the world of travel right now. Gilded is called "a brightly colored modern ode to the Gilded Age, complete with all the ornate trappings Gatsby himself would have admired" in this Newport travel guide. Pig + Poet, "where farm-to-table New American cuisine and craft cocktails are enjoyed under twinkling string lights on a three-season patio, complete with a fire pit for Maine’s chillier nights" is one of Maine's 10 must-try restaurants. This article lists the Captain Fairfield Inn as the top place to stay in Kennebunkport, Maine in this article on New England's top 5 most charming port cities: "A spin on the traditional bed and breakfast, the Captain Fairfield Inn is a historic Federal mansion filled with bold, modern design." The Hotel Portsmouth and Ale House Inn are recommended in this article on Portsmouth, NH as the perfect small-town getaway. Joey Wölffer, owner of Wölffer Estate Vineyards, includes 21 Broad in her Q&A about the best places to shop, eat and stay in Nantucket. Mike Guillen, general manager of Gilded and The Attwater, gives his top recommendations in this locals' guide to exploring Newport, RI. The Merchant is named Readers' Choice: Best Bed & Breakfast in the annual Best of the North Shore awards. Summercamp Hotel is highlighted in this guide to discovering the magic of Martha's Vineyard. The Pomegranate Inn is included in this article on "How Portland, Maine keeps getting cooler." This feature recommends Field Guide and its in-house restaurant, Picnic Social, as must-do's on a summer trip to Stowe. Summercamp was included on this short-list of camp style accommodations, described as a "fun, nostalgic, and retro-chic summer retreat designed for guests to relive their childhood glory days." Blue Door Inn is listed as the "essential" place to stay on a road trip through Mendocino. Whitehall includes "many modern touches... while maintaining much of the building's modern charm," while Pig + Poet "serves a selection of creatively prepares entrees and small plates made from locally sourced ingredients," outlined in this Camden travel guide. The Merchant and The Hotel Salem are listed as the top hotels in Salem in this article on why the city is "one of the most underrated and up-and-coming destinations for year-round travel in New England." In this feature on wedding venues in Stowe, Field Guide is highlighted as the top pick for guest accommodations. Summercamp, The Sydney, and The Christopher are all included in this travel spread highlighting places to stay, eat, and drink on these classic American isles. Both 76 Main and 21 Broad are listed as places to stay on Nantucket in this article of island "where to's." Lark's CEO, Rob Blood, discusses the "must-do's" on both Nantucket and Martha's Vineyard. Summercamp Hotel and its "wrap- around porch prime for drinking wine and watching the sunset over Oak Bluffs Harbor" are featured in this Martha's Vineyard travel guide. Salem was listed as one of the top five spots for a perfect New England road trip, with both The Merchant and The Hotel Salem being named as places to stay. Lark Hotel's founder and CEO, Robert Blood, was included on this distinguished short list of 2017 Up-and-Coming Hoteliers. Lark's Director of Design, Rachel Reider, is featured in this article highlighting her design work at Blue – Inn on the Beach, The Merchant and the soon-to-open The Hotel Salem. The Christopher was named Best Bed & Breakfast/Inn in this list of Martha’s Vineyard: Best of 2017. Salem is included as the best town for car-free travelers, with The Merchant being named the place to stay, in this list of Best Coastal Towns. This article calls Martha's Vineyard and The Christopher the perfect relaxing island vacation destination for Cancer signs. 21 Broad is named one of the best places on the island to stay for its modern feel and nightly BYOB mixer bar on this Best of Nantucket list. Summercamp, and its iconic rocking chairs, is included in this special edition "GO Escape" travel issue. 76 Main was included on this short-list of last minute Memorial Day getaways. The Christopher is called out for its "fantastic gourmet breakfast," while Summercamp is described as offering a "quirky ode to nostalgic fun." 76 Main is included on this short list of New England hotels with ridiculously preppy suites. Get a head start on summer fun with early bird deals like this one at Whitehall. Blue – Inn on the Beach was included on this list of island getaways, perfect for those "peace- and solitude-seeking vacationers." Both The Christopher and Ale House Inn are highlighted as places to stay on this list of "7 Charming New England Towns." Pig + Poet's inaugural Poetry Night on May 17 is highlighted in this weekly event listing. The Merchant is featured in this travel article for both its history and design-forward interiors. The Merchant, an "eighteenth-century home of a famed sea merchant...reinvented as a design-forward hotel," is included in this New England travel feature. Summercamp was included on this list of favorite hotels on Martha's Vineyard, noted for its "beautiful boutique feel and palette of summery colors." Summercamp, 21 Broad and 76 Main were all included on this list of "hot spots" to check out this summer season. The Sydney is highlighted for it's package deal special to "Martha’s Vineyard annual wine extravaganza." The Merchant was named "Best Main Street Project" for the way in which it preserves it's own history and pays homage to it's original owner, Joshua Ward, the sea merchant. Whitehall is described as "the newest addition to Camden’s roster of stately hotels...having both original glamour and Lark’s signature contemporary flourishes." With 11 miles of seemingly untouched sandy beaches, Blue–Inn on the Beach and Plum Island made this list of 10 lesser-known destinations to visit this summer. The Hotel Portsmouth and The Merchant were chosen as the best boutique hotel in New Hampshire and Massachusetts, respectively, in this annual list of top picks for dining, lodging, and things to do in New England. Blue–Inn on the Beach was named "updated favorite" for lodging in Massachusetts. The Hotel Portsmouth, an "intimate, 32-room hotel housed inside a 135-year-old historic mansion downtown," is noted as a place to stay in a recent article from Boston.com on where to eat, play, and stay in Portsmouth. Field Guide's onsite restaurant, Picnic Social, is featured in this roundup of the best "ladle-worthy soups" from all 50 states. In a recent article on Portsmouth, The Hotel Portsmouth is highlighted as "one of two polished Portsmouth boutique properties operated by Lark Hotels," making note of the "delightful common areas such as a well-appointed parlor and a cheerful sun room." "Fulfill your childhood fantasy of bringing your dog to camp" with a stay at Summercamp, Blue–Inn on the Beach, and Field Guide, all included on this short list of the best dog-friendly inns in New England. Field Guide and its onsite restaurant Picnic Social are included this hot list of best American ski resorts and apres ski bars. Blue–Inn on the Beach is highlighted in this feature on Newburyport, receiving special attention for its "color palette that mimics the beach scene" and outdoor hot tubs. In this Nantucket guide, 76 Main is described as "maintaining its Nantucket authenticity...while making way for the comforts and technology that 21st-century guests expect." Portland's Pomegranate Inn is described as "packed floor to ceiling with antiques and original works of art...including everything from traditional oil paintings of the Maine coast to funky modernist sculpture and furniture." In an article on the top attractions in Salem, The Merchant is highlighted as "both a historic attraction and a great place to stay," blending together "modern design and historic features." Summercamp's recent makeover is noted in this set of Martha's Vineyard travel tips as paying "homage to Oak Bluffs's history with rustic touches...while also including plenty of modern draws, including bright décor and harbor views." White House is included in this post about finding the right Napa Valley hotel for every personality, specifically for design lovers. Field Guide, where you can "enjoy the outdoor hot tub, peruse Stowe’s many menus on the iPad provided in your room by the gas fireplace, or have breakfast in bed with a picnic basket delivered to your suite," makes for a romantic retreat in this roundup of prime couples ski getaways in the East. Blue—Inn on the Beach, with its "striking suites and guestrooms with stunning ocean views," is within walking distance of the Parker River National Wildlife Refuge, site of the 10th annual Merrimack River Eagle Festival at the Parker River National Wildlife Refuge on Plum Island. White House, with "sunlight filtering through the chandeliers in the palatial living room during the evening wine social, and a backyard complete with a bright green lawn and in-ground pool" makes this list of ultimate couples getaways. Blue—Inn on the Beach and Gilded are included on this short list of best new hotels in New England. London's largest daily newspaper calls 76 Main "ideal for guests who want to stay in the thick of the action, as restaurants, shops and attractions are quite literally just outside the doors of this former sea captain’s home." With "personalized concierge service and modern rooms and suites with a chic earthy palette of greens, blues, and crisp whites," this article notes that "the charming 17-room" White House is the perfect escape for anyone seeking a weekend reprieve. The Merchant, "a property that retains a distinctive look that embraces Salem’s maritime past yet offers an array of modern amenities" is the lodging pick of choice in this article on a winter visit to this classic New England city. Blue—Inn on the Beach and Gilded are included in the magazine's annual "Best New Hotels in New England" feature. This article notes that 44-room The Hotel Salem, opening in July 2017, "will be an all-seasons destination inspired by the New England department stores of yesteryear...by mixing midcentury modern design with funky details from stores in the ’50s and ’60s, the hotel pays homage to the last gasp of the downtown department store—before the days of strip malls and big-box chains." "The Pomegranate Inn exudes the kind of quirky charm befitting a New England inn," according to this design lovers guide to Portland, Maine. The Merchant and Blue—Inn on the Beach are included in this romantic round-up of intimate Northshore hotels. "A hallmark of Lark Hotels are the eye-popping colours everywhere and The Attwater doesn’t disappoint," notes this rave review from across the pond. Ever wondered where a Larkie goes on a lark? Just back from their adventures in New Zealand, Lark's chief inspiration officer + director of digital technology share a glimpse of their photo journal. In this guide for a romantic weekend in Napa, White House and its "eclectic art collection, personalized concierge service, complimentary small plates breakfast, daily evening wine social, private outdoor pool, hot tub, and fire pit" is the #1 pick for where to stay. Lark CEO Rob Blood talks all things travel in this weekly column. Field Guide, with its "beautifully designed interiors, a seasonal pool, and a hot tub" leads this list of hot new ski hotels to check out this winter. In this island retrospective of 2016, the opening of Summercamp, "a boutique hotel with an upscale atmosphere mixed with astroturf, bright colors and various camp-themed ephemera" is noted as a highlight. In this year-end review of "good eats from all over," one editor calls Whitehall's Pig + Poet "the best overall meal she had in Maine this year." This round-up of hotels with fireplaces to help you escape the chill includes The Merchant's historical stunner, "complete with an iron hearth forged by none other than Paul Revere." This post shares the scoop on dozens of kid-friendly restaurants from coast-to-coast, including Field Guide's Picnic Social in Stowe. After being one of the first to try out Picnic Social's new brunch, this reporter gives the meal and restaurant rave reviews, noting "after a great meal at Picnic Social, I'm ready to include it in my regular restaurant repertoire!" This article wonders, "Have you ever been in a hotel room and wished you could buy the bedside lamp? Well, now you can, courtesy of the latest installment of pop-ups at the Shop on Newbury Street, which showcases the design sensibilities of Lark Hotels." In search of the holiday spirit in Stowe, this article notes that Field Guide "is a stylish, fun, and relaxed hotel, ideal for folks wanting a bit more than a B&B experience but less than a traditional resort." "Who hasn’t longed to move into a hotel at one time or another," wonders this article. "Well, now you can — sort of — as Lark Hotels hosts a pop-up at Newbury Street’s The Shop, kicking off on Dec. 13." Lark Hotels' Newbury Street pop-up shop from December 13-19 is highlighted in this feature on Boston's best holiday pop-up shops, artisan gatherings, and craft fairs. Picnic Social is noted as a "new hotspot for apres-ski" in this round up of the best of what's new. Picnic Social, with its "playful eats" and "fire pit for canoodling with cocktails in hand," is included in this list of 10 reasons to drive north for some wintertime fun in Stowe. This French-language article from Quebec's largest francophone daily calls attention to Field Guide's warm and modern decor, cozy common spaces, and impeccable service. Wondering where Boston's most notable men relax with a drink? Lark Hotels' CEO Rob Blood offers up his two favorite spots in this profile, both close to Blue—Inn on the Beach in Newburyport. In this list of Massachusetts' 10 most beautiful boutique hotels, 76 Main is noted as "an exposition of contemporary interior design inside a 1800s Federalist’s house; the charmingly tailored rooms are packed with modern furnishings, plush fabrics, and sophisticated amenities." This brand-focused feature on Lark Hotels' growing collection of boutique retreats notes that all 18 properties embrace a "true sense of place while delivering an authentic, relaxed and fun getaway experience with historic nuances, luxury touches, and spirit-lifting splashes of vibrant color." In this round-up of New England girlfriend ski getaways, Field Guide is noted as a hip and stylish place to stay in Stowe with its "contemporary furniture, bold colors, and whimsical accents like paper maché animal heads and furry foot stools." Field Guide is highlighted as one of the best hotels at which to kick up your feet after a scenic autumn hike. White House, "the rejuvenated 17-room mansion and national landmark built in 1886," is named as a high-end lodging choice in this feature on Napa for every budget. "Travel and wine is an age-old pairing," and this article on a global wine tasting tour highlights the historic White House in downtown Napa and Mendocino's elegant Blue Door Inn, part of the Blue Door Group. "Now is the perfect time to beat the crowds and savor autumn’s sublime weather on Martha’s Vineyard," notes this article featuring Lark Hotels' three new and distinct island properties — Summercamp, The Christopher, and The Sydney. The "luxe fabrics and deep hues" of this fall fashion shoot are a perfect match for The Merchant's chic interiors. This list of 13 creative ways to rediscover the charm of Salem this fall suggests booking a room at The Merchant to stay close to the bewitching action. In this article on "new high-end hotels that blend modern design and amenities with technicolor surrounds," The Merchant receives high praise for its punches of color and historical features. The Break's "vibrant interior, spacious rooms" and deep surfing roots make the hotel and South County Rhode Island a perfect post–Labor Day escape. This article recommends "having a cocktail at the rooftop bar, then grabbing some grub at the hotel's Chair 5 restaurant." Lark's CEO Rob Blood and Chief Inspiration Officer Dawn Hagin added their most memorable meals to this list of "two hundred and seven of the greatest restaurants around the globe, according to those who eat, cook, and travel for a living." With its "fantastic fall foliage come September, as well as warm weather in the spring and abundant outdoor activities during summer," Stowe is featured in this article on the best off-season mountain towns in North America. Field Guide - with its on-site restaurant, Picnic Social, pool, and outdoor area - is called out as the place to stay for a shoulder season visit. Field Guide, 21 Broad, Summercamp, The Christopher, and The Attwater are featured in this article on Boston summer getaways that are actually better in fall. This article in the magazine's fall travel issue recommends a stay at Field Guide and a stop at Picnic Social during a pre-snow visit to Stowe. The Merchant, "designed thoughtfully, with a diligent eye to detail and keen playfulness with color," is highlighted in this article exploring Salem sans witches. Summercamp's "airy and bright interiors, complete with Ping-Pong, a camp canteen that serves up classics like Cracker Jacks, and silky soft bedding" are noted in this article on stylish new and revamped hotels across New England. Mendocino's Blue Door Group and The Attwater in Newport are included in this roundup of nine classic weekend getaways that are better in the fall. Lark CEO Rob Blood, "whose personal recipe of authenticity, passion, and 'not waiting until tomorrow' is one of the driving force behind the group’s success and expansion," is included in the magazine's annual Movers & Shakers feature. "Soothing décor, a plush lounge, natural touches like fresh flowers in rooms, and a quaint deck perfect for afternoon tea make Blue Door Inn a relaxing home base" for a getaway to coastal Mendocino. This guide of things to do on Plum Island notes that "you couldn’t get any closer to the water unless you were just about to dive in," and that "Blue's beach common area (complete with fire pits) offer the perfect dose of relaxation" after a day of exploring. The duo known as the Travelin' Mainers give Whitehall and Pig + Poet high marks for everything from the decor to the delicious dining experience. Lark Hotels CEO Robert Blood and Chief Inspiration Officer Dawn Hagin are featured in this Q&A on "the boutique hotel brand you should have on your radar," noting The Hotel Salem's fall 2017 debut. Field Guide and Picnic Social's Prosecco Popsicle are included in this round up of 4 cocktails worth the drive (& where to stay afterwards). "Fresh off a complete renovation, the charming White House in downtown Napa perfectly blends traditional appeal with modern elegance," as noted in this feature on 12 of the best boutique hotels to visit in California wine country. Gilded serves as a decadent backdrop for this fashion spread on "jewel tones and inky hues in luxe fabrications that embrace a plush touch for fall." Wary of "corporate and sterile" hotel eateries, this feature reports that "Happily, the spot lived up to its promise. From the lawn games to the food to the friendly service, Picnic Social was a scrumptious, and silly, success." The Break "has multiple personalities, all of them fun," notes this rave review. Following a dinner experience at Chair 5, the reporter comments that "Executive chef Basil Yu is quickly building a reputation as one of the area’s sharpest culinary talents." On Yankee Magazine's newly launched website, this feature on the 10 Best Seaside Inns in New England describes Blue as "set among sand dunes and sparkling like a lapis lazuli gemstone." The perfect weekend on Martha's Vineyard includes a stay at Summercamp for groups or families, while couples will enjoy a romantic stay at The Christopher. In this article on redefined camp-outs, Summercamp, "a property of mischief-meets-modern inspired Lark Hotels" is noted for its "nostalgic, camp-cabin touches." Sister Larks in Edgartown, The Christopher and The Sydney, are mentioned as well. This feature shares the design scoop on Lark's trio of new Martha's Vineyard hotels - The Christopher and The Sydney in Edgartown and Summercamp in Oak Bluffs. A trip to explore Nantucket's whaling history includes a stay at 21 Broad, located just steps from the island iconic Whaling Museum. In awarding Chair 5 "Best Waterside View," this review notes that "it's hard to find a better place to savor a Chairtini in the Ocean State than Chair 5's direct sightline to the water." A stay at the "mini museum" Pomegranate Inn is recommended in this issue's Wandering Designer feature on Portland. With a tasty yet tongue-in-cheek look at the Pig + Poet menu, this Maine monthly notes that "Chef Yeaton can't resist adding a touch of mischief" to Whitehall's signature restaurant. Chef Dirk Yeaton "wants your mouth doing a happy dance" after eating at Whitehall's Pig + Poet, and according to Maine's largest daily newspaper, he delivers. Summercamp (#23) and Field Guide (#27) are included in a feature on 50 ways to take your Boston-based summer to the next level. "In-room iPads, a boutique wine list, bold interior design, and super-friendly innkeepers" earn Captain Fairfield Inn a spot on this Best of Kennebunkport travel guide. A stay at Whitehall, plus cocktails and dinner at onsite restaurant Pig + Poet, is included as top reasons to visit Camden, Maine this summer. One of Field Guide's general managers is quoted in this article on the return of Jell-O shots to the bar scene, including the trendsetting varieties found at Picnic Social. Between its colonial history, array of local craft brews, and unique boutique hotels such as Ale House Inn, National Geographic makes the case for Portsmouth as the Greatest Small Town in the US. This daily fashion broadsheet features Lark Hotel's new in-room magazine, On a Lark, noting its emphasis on highlighting locally made and sold goods. Our two Edgartown boutique hotels, The Christopher and The Sydney, are highlighted in this travel article on what's new in Martha's Vineyard. The transformation of Blue into "a sparkling gem" is profiled in this industry publication. This review of Pig + Poet notes that "Whitehall is getting noticed for its hip, casual bar and restaurant, fit with exceptional cocktails, locally inspired food, wrap-around porches and chic fire pits." Dawn Hagin, Lark's Chief Inspiration Officer, is quoted throughout this in-depth look into Maine's changing hotel landscape. Whitehall is cited as an example of the ideal coastal Maine summer retreat for today's travelers - modern, luxurious, and tied to tradition. No beige walls here! This French language article details the high design and upscale amenities that set Lark Hotels, such as Whitehall and Field Guide, apart. "Chef Basil Yu's beach fare with an elevated touch" and Chair 5's new weekend brunch are highlighted in this travel guide on what's new this season in the Newport area. Lark Hotels is one of three collections on the forefront of bringing boutique hotel style to smaller US locations. CEO Rob Blood discussed "the motivation to bring a new, fresh, modern take on New England hospitality," using Field Guide, Blue—Inn on the Beach, and Summercamp as examples. Dirk Yeaton, Executive Chef at Pig and Poet, Whitehall's signature on-site restaurant, and Lark Hotels Group Executive Chef Justin Perdue are highlighted in the magazine's “New + Noteworthy” section. Summercamp is featured in an article on Martha's Vineyard wedding locations with breathtaking vistas, guest amenities, and island charm. Lark Hotels "has picked a plum spot for Blue on the darling of Massachusetts' North Shore, Plum Island" according to the Globe. In this cheeky piece, Boston Globe reporter Christopher Muther declares, "ready or not, chic comes to the Vineyard" by way of Summercamp in Oak Bluffs and The Sydney and The Christopher in Edgartown. Summercamp is included in a round-up of five last minute 4th of July getaways. The openings of The Christopher and Summercamp are profiled in this article on new boutique hotels on Martha's Vineyard and Nantucket. The Improper Bostonian chronicles how Rachel Reider transformed Summercamp with "her sophisticated yet approachable aesthetic, trademark color palette of cool blues and warm sands...and her own experiences as a third-generation summer camper." This article on the resurgence of Napa's downtown area highlights White House as the place to stay while you wine and dine around the valley. Chair 5's signature surf style and seasonal eats get top marks in this profile on summer eating in Rhode Island. Boston's largest daily newspaper shared the news that "beach lovers will soon be able to spend the night on Plum Island again," thanks to Blue—Inn on the Beach's June reopening. Summercamp was included in the paper's annual "Off Duty Summer 50" feature, which focused on clever ways to beat the heat. Field Guide was profiled as one of only three recommended mountain destinations nationwide in this guide to "The Most Relaxing Vacation Spots in the United States." The Father's Day special at Field Guide was featured in this round-up of late June escapes. Captain Fairfield Inn was featured in an article about 48 Hours in Kennebunkport, Maine and was described as "renovated with a chic, modern vibe." The Attwater and our general managers were featured in this article on how to best experience Newport, Rhode Island. 21 Broad was the recommended hotel stay in this article on a weekend on Nantucket, stating, "It’s so beautifully designed. . .plus, a comped small plates breakfast of cheeses, fruit, overnight oats and hotel-made baked goods." The New York Times included Summercamp in a feature on family-friendly accommodations, nothing the hotel's "bright, playful décor and nostalgic accents." Summercamp is featured in this iconic style magazine's round up of 11 Stunning New Beach Hotels to Book Now. The openings of The Christopher and Summercamp are noted in a Where + Wear profile offering packing inspiration for a classic New England getaway. "Channeling childhood and the glory days of summers past," the reimagined Summercamp was profiled by the magazine. Blue - Inn on the Beach was noted in a feature on best laid-back beach towns in the Northeast that included Newburyport. The Christopher and its designs "inspired by the vibrant hues of the French Caribbean" made CNN's short list of best new US coastal hotels. Summercamp's "playful redesign captures the joy of summertime and the spirit of camp days, balancing nostalgic details with the modern day amenities," according to this premier design magazine. The brand and interior design of Summercamp was featured in this industry magazine article, which correctly stated that the hotel was, "designed to vibrantly capture the essence of summertime—catching fireflies, splashing in the water, campfire songs and swinging on a tire." This industry publication featured the grand opening of Summercamp on Martha's Vineyard, stating, "With the neighborhood’s history in mind, Lark Hotels crafted the brand concept to reflect an emphasis on playful gatherings, personal connection, and nostalgia." The paper of record posted this stellar review of Whitehall calling the vibe at the hotel, "a dreamy postcard summertime of a century ago." Whitehall was featured in all its colorful glory in this Sunday Globe New England Travel article, which called our Camden, Maine hotel, "a beaut of a property." An article on Hip Hotels in this popular British travel magazine featured Field Guide calling it "a hotel that combines stellar interior design with the great outdoors." This industry publication featured how Lark Hotels got its name and our approach to embracing an "unexpected sense of place" at all our properties. The Merchant was cited as a classic example of this. The Merchant was featured in this issue on "hidden gems," which stated, "The inn represents the best of what Salem has to offer: a sense of history and gravitas melded with modern amenities and a contemporary reimagining of the space." Blue Door Inn of the Blue Door Group was featured in this travel journal article on Mendocino. White House was cited as one of the hottest hotels to open in Spring 2016. Summercamp was featured as "a grande dame of a Martha’s Vineyard hotel given a retro remodel so you can relive your camp days in luxury." On Super Tuesday, this premier travel publication listed White House as one of the magnificent hotels that resemble 1600 Pennsylvania Ave., stating, "now a 17-room hotel that pockets chic and classic vibes in each nook, it's blocks from downtown and also boasts an on-site spa." White House was featured as one of 16 exciting new hotel openings in this travel publication's slideshow. A rave review in this Boston-area magazine gives The Merchant's interior design a shout out, stating, "the hotel’s decor is respectful of the building’s notable roots, staying true in spirit to its 18th century architecture while managing to infuse the former mansion with a thoroughly modern sensibility." This Massachusetts-based magazine calls The Merchant a "visionary 11-room boutique property," with decor that "is respectful of the building’s notable roots...while managing to infuse the former mansion with a thoroughly modern sensibility." This major Canadian paper called Field Guide, "a quirky gem of a hotel in Vermont ski country," in this great review of our Stowe hotel. Gilded was featured as the place to stay in this article on 5 New Reasons to Visit Newport R.I.
Field Guide was named one of the 7 best new hotels in ski country by this popular outdoor living magazine. Field Guide was featured in this article on romantic winter retreats as offering "big bathtubs next to windows with wide-angle views [that] practically cry out for bubbles (maybe some in a flute, too)." The Hotel Portsmouth was featured and the Ale House Inn mentioned in this feature on getaways to Portsmouth, NH. The Merchant was profiled in this suburban Boston publication, which described our new Salem MA boutique hotel as,"fusing an elegant modern vibe with ornate 18th century details and Asian influences." The Break was featured as one of the "Top Ten Waterfront Hotels in the Northeast." Both of our Portsmouth NH hotels were featured in this article on weddings on the New Hampshire seacoast. The Hotel Portsmouth was profiled as a location for housing guests, and the Ale House Inn was mentioned as a great spot for a mini-moon. The opening of The Merchant was featured in this Boston Globe profile, which said of the Salem boutique hotel, "Riffing on the theme, guests get a welcome gift of Sumatran pepper and a recipe for a rum-and-pepper cocktail. It’s a metaphor for The Merchant: history, served with a shot of spice." This feature article on Field Guide as one of Vermont's new rustically elegant boutique hotels states, "Casual and comfortable with a bit of elegance and edge: They’ve hit that mark." The hip online magazine called The Merchant, "a richly decorated 11-room hideout where our nation’s first president once called it a night." Forbes.com named Whitehall to its list of best new hotels of 2015, with the travel reporter stating that our Camden ME hotel, "had her at curated small plates!" The red patent banquette, vibrant colors, and shuffleboard outside also were mentioned. This article on where to go in 2016 featured destinations around the world and Maine was one of them! Best of all, Whitehall was listed as the stylish new place to stay in Camden, Maine. Field Guide was named one of 7 new hotels at which to "skip the holiday stress." Both Gilded and The Break were named as "Best Hotels in the Northeast for 2015" by Arrive, the Amtrak onboard magazine. The venerable NYC paper reviewed a stay at Gilded, stating "Gilded strikes the right balance between old-fashioned charm and modern comfort." Field Guide was featured in an article on eco-friendly winter vacation ideas, which stated, "guests seeking cozy modern digs inspired by the Green Mountain State along with hot tubs, fireplaces, and a fresh take on the best local adventures will discover they’ve come to the right place." Field Guide is featured as a luxury winter destination in this skiing article in Departures. Travel + Leisure includes Gilded in a round-up of perfect hotels for a weekend getaway from NYC. Calling everything at Field Guide "new and exciting," the venerable Quebec daily states, "The decor throughout is fresh, pure and woodsy. It’s evocative of Vermont’s four seasons, with an appealing mix of avant-garde, vintage urban cool and country warmth." Field Guide was previewed in this travel article in the NYT online. Field Guide was profiled as a new hotel that "aims to be your home base for all leaf peeping, hiking, skiing, and other Vermont vacation experiences," in this article entitled, High-octane ways to enjoy fall colors. Called a "designed-minded new stay with serious style," Field Guide was profiled as one of 24 exciting new hotels worldwide opening in Fall 2015. Deeming our award-winning Nantucket hotel a place where "preppy and hipster collide," the venerable Canadian publication reviewed 21 Broad, calling it "a boutique inn that blends fresh, modern style with the island’s historic sensibilities." Feature on the Lark Hotels brand that also profiles our Spring/Summer 2015 hotel openings, Whitehall, Gilded and The Break. The article highlights our "small is powerful" brand focus, stating, "These are all small things, but they add up to something big. That’s another way the lark metaphor works: It’s a little bird, but it makes a lot of noise. And it heralds the dawn of something new." Field Guide is called a "smashing new mountain lodge in Stowe" in this cheeky article on our October 1 opening. Lark Hotels and our hotels Ale House Inn, Captain Fairfield Inn and Field Guide were featured in this Quebec publication's article on small hotel groups. Pomegranate Inn was one of only two hotels profiled in this feature about the "locavore restaurant" town of Portland. Gilded and The Attwater are featured in the New York Post's article on the "newly emerging cool side of Newport, RI that’s shaking up everything from hotels to the dining scene." The Merchant's history and design inspiration are the focus of this profile by Salem, MA's hometown newspaper. Lark Hotels and our stunning Newport hotel Gilded are featured in this article on exciting new lifestyle hotel brands. The magazine defines Lark Hotels as, "A collection of design-centric inns in popular (mostly Northeastern) vacation destinations, each with its own name, a handful of rooms, and a family-run feel." 21 Broad was featured as the chic, modern place to stay in an article on "The Best of Nantucket in Three Days"
The Attwater was profiled in a feature on retro style hotels. The article states that the hotel's dining room, "feels more like a Greenwich Village café than a New England B&B and the tapas-style breakfast is a real treat involving lots of small plates, including baked eggs, fruit cups, and savoury scones." 76 Main and 21 Broad were featured as recommended hotels in this article on Nantucket. The piece stated that 21 Broad "caters to every need of the modern traveler." Our CEO and Chief Inspiration Officer were profiled in the "Game Changers" feature in this popular publication for the hotel and restaurant industry. Gilded, and its Narragansett neighbor The Break, are included in this cheeky profile titled "Putting the 'New' in Newport." Calling it a "gorgeously sassy little boutique hotel," the venerable coastal lifestyle magazine profiled Gilded in this online article. The Attwater was profiled as a featured place to stay in Newport with well curated photos that "subtly reinforce a nautical air." Boutique hotels like The Attwater in Newport offer high end amenities like in-room iPads and a creative small plates breakfast. Rachel Reider has brought Gilded Age decadence to Lark Hotels’ newest outpost, Gilded, in Newport. Whitehall was called an "iconic summer hotel stay, updated and sassed up by a terrific redesign" in this online love letter to coastal Maine. Bold design, great amenities, and a decadently delicious breakfast spread make Gilded the perfect spot for an East Coast summer vacation. Chef Sam Talbot's "celebration of modern-American-Maine food" at Pig + Poet at Whitehall is a hit with the Bangor Daily News. The island of Nantucket may be modernizing but it's staying true to its roots at the same time, with 21 Broad and 76 Main noted as chic boutique hotels tucked in behind Victorian facades. 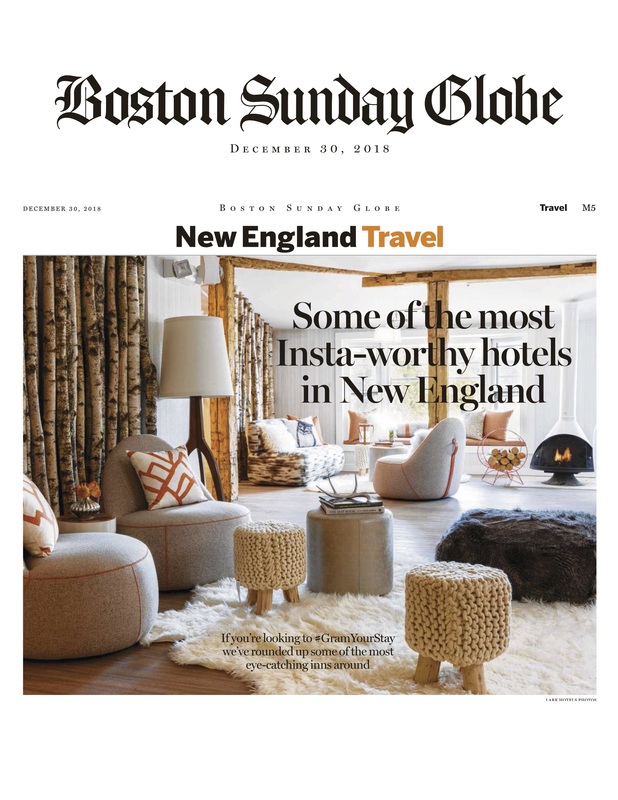 The Globe describes Gilded as the antidote to the traditional New England bed-and-breakfast. The Montreal Gazette lauds Whitehall's transformation as the perfect blend of history and charm and contemporary cool. The grande dame of architecture and design magazines includes 21 Broad on its short list of boutique hotels to help you get in the mood for summer in New England. Newport, with a stay at The Attwater, is a great summer weekend getaway from NYC for adventurers and lazybones alike. Eater Maine, where adventurous diners go to learn the latest local restaurant news, shares a preview of Whitehall's Pig + Poet on opening day. Whitehall's hometown newspaper chronicles the restoration of this iconic property and the opening of the on-site restaurant Pig + Poet. Gilded and The Break are included in this round-up of unique New England properties opening just in time for a summer getaway. Lark Hotels CEO Rob Blood shares his thoughts on why boutique hotels such as The Attwater are uniquely suited to meet the needs of today's travelers. This daily online hipster digest takes readers on a brief design tour of Gilded in Newport, RI. 21 Broad was one of only 11 U.S. hotels named to Conde Nast Traveler's 2015 Hot List. Urban Daddy, an online trend spotter, gives a nod to the restored Whitehall in Camden, Maine. Hotel Chatter, a daily web digest covering everything hotel-related, features the spring openings of Gilded, Whitehall, and The Break. This bridal publication finds The Pomegranate Inn, with it's in-room fireplaces and delicious breakfast baskets, to be the ideal respite for honeymooners in Portland, Maine. Downeast names Pig + Poet, the signature restaurant at Whitehall, as one of the most highly anticipated restaurants of 2015. Whitehall and Pig + Poet, the property's restaurant helmed by Chef Sam Talbot, are featured in CNT's online Hotel Report, a weekly roundup of the latest hotel buzz. 21 Broad is featured as a top New England honeymoon destination by Boston Spirit. Dream Vacation Magazine named Gilded as one of the best birthday vacation destinations for 2015, ideal for a girlfriend or couples getaway. Gilded, nearing completion for her May 1 debut, is featured in CNT's online Hotel Report, a weekly roundup of the best of what’s new and what’s coming up in the world of hotels. 76 Main was featured in this article on the 10 Most Beautiful Boutique Hotels in Massachusetts. Chef Sam Talbot, Pig + Poet and Whitehall are featured in this article on Maine chefs appearing at the 2015 Boston Wine Expo. Whitehall, our new hotel opening May 2015, and its restaurant, Pig + Poet, were mentioned in this Bravo TV article on Chef Sam Talbot. Bangor Maine's daily newspaper featured the renovation of Whitehall and the partnership with Chef Sam Talbot on Pig + Poet. Maine Today, the state-wide website for the Portland Press Herald, featured the renovation of Whitehall and the collaboration between Lark Hotels and Chef Sam Talbot. This esteemed Portland Maine dining resource covered Lark Hotels' collaboration with Chef Sam Talbot on Pig + Poet, the new restaurant at Whitehall in Camden Maine. The Boston Globe Travel Section profiled the new Urban Beach House at The Attwater. N Magazine featured a detailed article on the history and renovation of 21 Broad and its stunning new look. Our hotels 21 Broad and The Break were featured in a CNN online article about "9 great new U.S. beach hotels"
The “sassy” lamps at The Attwater made for an amusing article in Hotel Chatter. Oh, they loved so many other things about our Newport boutique hotel, too. 76 Main was honored to win “Best Inn on Nantucket” in the 2014 Best of Boston awards. Bon Appetit named Ale House Inn as one of the 10 Great Beer Lover Hotels in America. Our new Nantucket hotel, 21 Broad, and The Urban Beach House at The Attwater were profiled as “hot tickets” for July in the Fort Worth Star-Telegram. Nantucket’s most storied property to grand open with a modern renovation and summer special. Our hotels 21 Broad, 76 Main, The Break and the new Urban Beach House at The Attwater were all mentioned in the magazine’s “New and Noteworthy” section on hotel design. 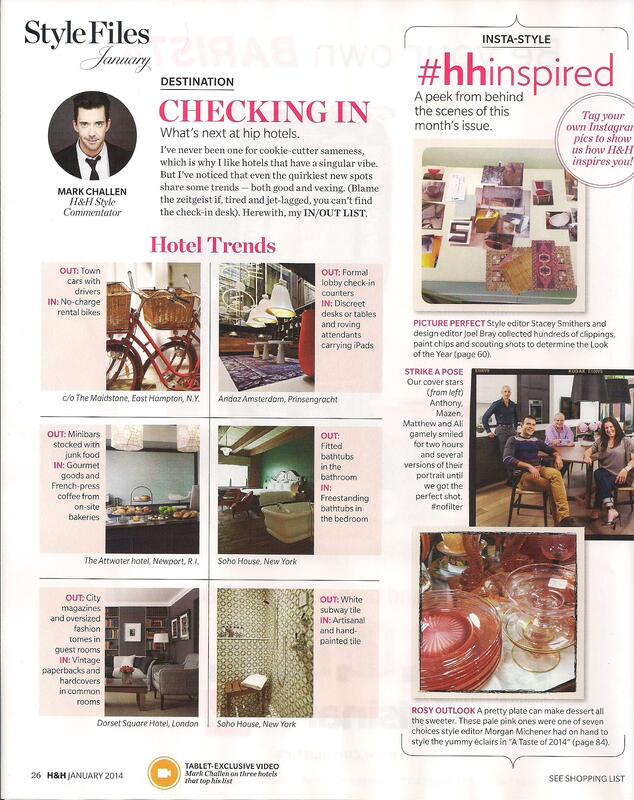 The Attwater’s homemade baked goods and fresh French press coffee were featured in a style article on Hotel Trends. Portland Maine was named as a top place to visit in 2014 and our Pomegranate Inn call THE place to stay. Both 76 Main and Pomegranate Inn were chosen for inclusion in the Amtrak train publication’s “Best Hotels of the Northeast 2013″ round-up. 76 Main was one of only three Nantucket properties included in Travel Curator’s August profile of Cape Cod and the Islands. Lark Hotels’ partnership with vineyard vines was mentioned in an article about the marketing strategies of the lifestyle clothing brand. A photo of the vineyard vines suite at Captain Fairfield Inn was included in the article. Pomegranate Inn's breakfast was featured on a Portland Maine morning show. Both 76 Main and The Attwater were included in a round-up of vacation getaway destinations. Both 76 Main and The Attwater are featured on this travel website’s new itineraries profiling Nantucket and Newport. Read Nantucket article. Read Newport article. Our vineyard vines suites at Captain Fairfield Inn and 76 Main are profiled in this style article. “While the rooms needed to have the look and feel of vineyard vines, it was equally essential that they possess the signature appeal of Lark Hotels—which strives to interpret “coastal” in modern, streamlined, and unexpected ways.” Read full article. Captain Fairfield Inn is included in a detailed article on Kennebunkport in this French-language publication. The breakfasts in particular are profiled. Our vineyard vines suites at Captain Fairfield Inn and 76 Main were profiled as the “preppiest hotel suites you’ve ever seen” on the Conde Nast Traveler daily blog. 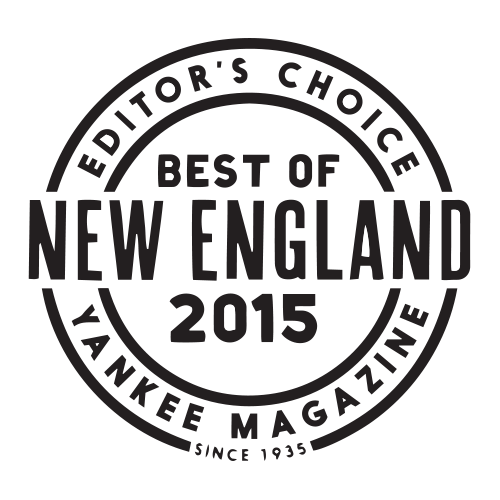 The Attwater was picked as a 2013 Best of New England “Editor’s Choice” by Yankee Magazine. The article gives us the title “Best Designer Hotel” in Newport, which is a great fit for us! We are thrilled that our boutique Newport RI hotel, The Attwater, made the 2013 Conde Nast Traveler Hot List! Especially since we are one of only 16 US hotels to do so! It is a great honor after going through a major renovation and re-opening less than a year ago. Captain Fairfield Inn was profiled as one of 10 Romantic New England Inns. The Attwater was included in the publication’s Best Hotels of the Northeast 2012 feature. Captain Fairfield Inn’s Halloween package was featured prominently on the Travel Today section of the Today Show website. The Attwater was featured in an article on new hotels in Newport and Nantucket. The Attwater was included in an article on 20 Weekend Getaways at Repurposed Hotels. Chapman House and The Attwater included in a post entitled Checking In: Summer’s Best Hotel Openings. The Attwater was featured as a “Friday Favorite” for our chic and “lounge-worthy” design by Rachel Reider Interiors (and our homemade cookies!). 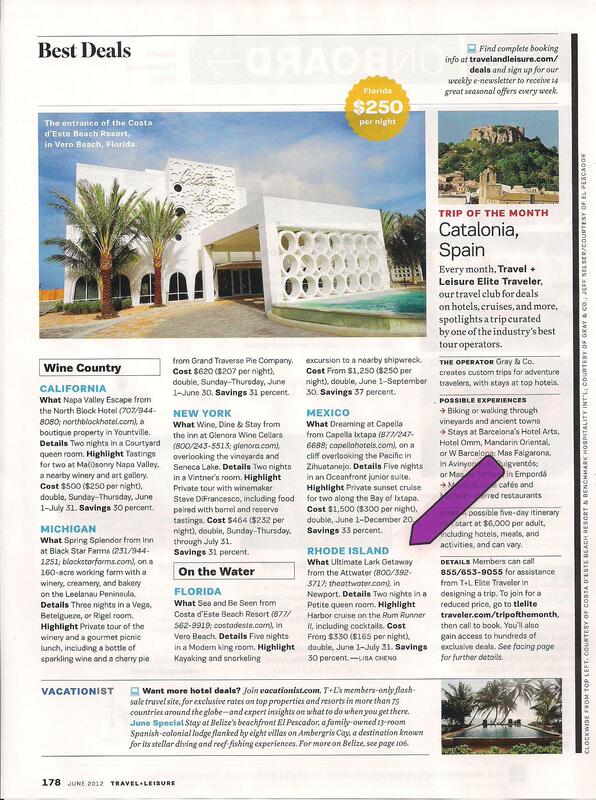 The Attwater’s “Ultimate Lark Getaway” included as a Best Deal in the June 2012 issue. This traveling foodie ventures to Salem, MA, and finds respite at both The Hotel Salem and The Merchant, enjoying the boutique hotels' modern amenities and close proximity to the bustling pedestrian mall of downtown Salem. An artist, jewelry designer and mother of three, Elizabeth escapes to Saratoga Springs for a family getaway at The Downtowner, relishing in the newly renovated hotel's modern and bright atmosphere, and dog-friendly accommodations. This fashion and mom blogger, and native of upstate New York, always stays at The Downtowner on her weekend trips to Saratoga, for the boutique hotel's close proximity to downtown and its in-house coffee bar. New York based travel and lifestyle blogger ventured upstate to Saratoga Springs for a weekend escape to The Downtowner, and left raving about the hotel's unique coffee bar and central downtown location. Boston-based lifestyle blogger stays at The Coonamessett for an off-season retreat to Cape Cod, enjoying the remote charm of the countryside cottages. For her first trip to Nantucket, this New England native chose to stay at 76 Main, with it's ideal downtown location and meticulously decorated spaces. Charleston blogger and shop owner channels the Summercamp Hotel in Martha's Vineyard as the inspiration for her playful and elegant downtown Charleston home. This born and raised Boston blogger loves the personal experience boutique hotels offer, and raves about her weekend getaway to Cape Cod's The Coonamessett inn. This New England blogger curated a holiday gift guide, including a stay or a gift card to any of the Lark Hotels locations as an ideal gift. This blog aimed at modern families names The Coonamessett "the perfect respite," harmoniously blending antique and contemporary aesthetics for an ideal Cape Cod vacation. This Boston-based food and travel photographer writes about her cozy fall stay at Field Guide with her dog. This New England blogger chose to spend her wedding anniversary with her husband at The Coonamesset, the newly renovated inn, located in the coastal town of Falmouth, MA. These two DC-based bloggers enjoy a luxurious weekend getaway at 21 Broad, indulging in the Vitamin C shower and lounging by the fire pit on the patio. This Boston food blogger's quick trip to Salem capped with a visit to Counter at The Hotel Salem. A Boston-based lifestyle blogger recounted the best moments of her leaf-peeping trip through Vermont, with a stay at Field Guide. A local blogger in need of a weekend getaway reported that Whitehall "immediately makes you feel relaxed and in another century." A local lifestyle blogger called Counter at The Hotel Salem's menu a perfect combination of "approachable and surprising." In a busy 24 hours exploring Mendocino, this blogger finds a cozy respite in a charming cottage at Packard House. This Southern blogger took a trip up north to visit Whitehall in Camden, Maine. This blogger spent her weekend relaxing on island time at 76 Main, a boutique hotel in the heart of downtown Nantucket. "The entire property is truly delightful", raves this blogger about the hotel Summercamp and her family's getaway to the stunning island of Martha's Vineyard. This New England blogger visits the Hotel Portsmouth for an idyllic fall weekend in New Hampshire. A round-up from this national lifestyle site lists the top places to travel in October, including Stowe and luxe lodge accommodations at Field Guide. A blog post about Salem's witch-free history includes The Merchant's historic federal-style space, built in 1784 for prominent sea merchant, Joshua Ward. The Hotel Portsmouth made for a relaxing baby-moon destination for this Boston-based blogger. This New England-based influencer gives her childhood camp days an upgrade at the chic Summercamp hotel in Martha's Vineyard. This New York City-based influencer soaks up a stay at AWOL and calls the hotel "absolute interior design goals." This New England-based influencer soaks up her stay at Whitehall that felt like a "luxury Maine experience." This Boston-based influencer recounts her recent stay at The Hotel Portsmouth, from the all-too-comfortable beds she didn't want to leave to the complimentary breakfast spread, the hotel "makes you feel right at home." This New England blogger recommends her favorite home away from home, 21 Broad, whether you're visiting Nantucket for the "first time or the 50th time!" 76 Main served as a home away from home for this New York City-based lifestyle blogger during a recent Nantucket getaway. This coastal New England blogger calls Whitehall "colorful and quaint" with "historic charm beyond compare." This Florida-based blogger visited Marco Island for the first time, and fell in love with the "quaint and beautiful" Olde Marco Island Inn & Suites. This Canada-based blogger shared her itinerary for a perfect three-day trip to Nantucket, complete with a stay at 21 Broad: "21 Broad is a boutique inn located in the heart of Nantucket and was not only an incredibly convenient location but fit my charming Nantucket vision." This Canadian lifestyle blogger stayed at 21 Broad during a weekend trip to Nantucket, saying "this beautifully decorated inn felt relaxing and laid back after each day of exploring." This travel blogger shares her poetic take on a weekend getaway at the newly renovated JD House. This New England-based blogger loved Whitehall's "bright, colorful, and fun" interior during her weekend trip to Camden. This Boston-based influencer and stylist captured Captain Fairfield Inn's "well-blended mix of old and new and "historic elements of a former 1813 home." Summercamp's décor, staff, and location made this blogger's stay a "getaway dream." From beaches to boating and great seafood, this Florida-based blogger called Olde Marco Island Inn & Suites one of the most relaxing places she's ever been. This fashionable Texan couple tapped into their playful sides during this Martha's Vineyard getaway at Summercamp. Emily shared highlights from her Camden, ME trip, including Whitehall's "upscale summer camp cabin" vibes. Boston-based blogger spent a girls getaway weekend at Summercamp, saying that "from the massive porch lined with rocking chairs, to the swings hanging in the lobby, and canteen stocked with snacks, it's the perfect place to getaway for a few days and recharge." Shauna shared her perfect Camden, ME itinerary, complete with wine and relaxation on Whitehall's "absolutely stunning" patio! This NYC-based influencer made 76 Main her home away from home for the weekend and shares her Nantucket travel guide. This Pittsburgh-based style blogger loved 76 Main's classic vibe and modern touches that "put you in a vacation state of mind." South Florida-based blogger put a stylish twist on her weekend stay at the Olde Marco Inn. Boston-based influencer loved Whitehall's "modern, yet cozy design, while keeping a strong sense of place." This Boston-based blogger chronicled her spring stay at newly-opened Lark Hotels spot, The Hotel Salem. Chicago-based travel blogger Kit shares her favorite details from a weekend getaway at Gilded, including the "historic building with modern furnishings and amenities." Florida-based blogger Sarah Hunt spent her babymoon in Newport, complete with a relaxing weekend in the "fun and lively" Gilded Hotel. This Boston-based blogger stayed in one of our "well-styled" and "super cozy" micro rooms, proving there's something for everyone at The Hotel Salem! Boston-based blogger loved the Gatsby-esque details during her weekend stay at Gilded. This New England blogger loved The Merchant's "sense of New England Charm with a whimsy twist" during her Salem weekend getaway. Boston-based food blogger spent the weekend eating around Salem, including dinner at Counter and a stay at the Merchant. Local to Salem, Donna Seger brings the city's history to life and after staying at The Merchant describes the hotel as having "a beautiful central hallway...taproom/lounge adorned in jewel-box colors, amazing woodwork everywhere, details, details and more details." Boston-based influencer recommends The Merchant in her Salem travel guide, saying "if you’re someone who prefers more intimate accommodations paired with high-touch customer service and a comfortable yet chic decor, The Merchant is an ideal property for you to enjoy during your visit to historic Salem." New England-based blogger Shannon shares her favorite details about The Attwater in this blog post. This influencer enjoyed Gilded's small plates breakfast, funky decor, and helpful staff. This San Francisco-based influencer describes the Blue Door Inn as "nestled along the cliff-side of Mendocino, and is a truly luxurious, romantic, and cozy property, in the most unpretentious way." Following a getaway at Field Guide, this New York-based influencer says "the key to traveling in Winter is to hit the mountain in the middle of the week," followed by unwinding "by the fire every night with a bottle of wine" or with a tasty cocktail from Picnic Social. Following a girls getaway to Newport, this New York-based influencer notes Gilded's delicious breakfasts, unforgettable decor, wonderful service, and cozy rooms as highlights of the trip. Following a chilly November lark to Newport, this Boston-based influencer described The Attwater as not only having the perfect location but also her top three hotel must-haves: a "thoughtful design, comfortable bed & linens, and nice products in the bathroom." After a recent family getaway to Portsmouth, this New England-based influencer describes The Hotel Portsmouth's location as "perfectly walkable to everything in town," and details the breakfast as offering "so many options outside of the typical yogurt and cereal." After a recent trip to Newport, this Boston-based luxury travel and lifestyle brand describes The Attwater not only as "funky, stylish and unique," but says the best part of the stay, the breakfast, is "tasty, healthy and imaginative." Following a recent trip to Mendocino, this San Francisco-based influencer describes the interior of the Blue Door Inn as a "modern version of Victorian charm" and highlights the various amenities including the "rainfall shower and/or a deep soaking tub," as well as the daily breakfast "basket of goodies." After a recent trip to the East Coast, this influencer-duo based out of Silicon Valley describes Blue - Inn on the Beach as a "dreamy boutique hotel and the most romantic spot for a coastal getaway." This Ukrainian-Polish blogger turned American influencer describes Gilded as a having a "chic Newport inn interior...with a daring design." Following a mid-September getaway to Camden, this Boston-based influencer notes enjoying Whitehall's on-site restaurant, Pig + Poet, as well as its "home-cooked breakfast" and close proximity to Camden Hills State Park. After a recent trip to coastal Maine, this travel and lifestyle influencer describes Whitehall as "an interior dream that wraps you up in a hug from the moment you step in" and is "the perfect place to experience all Camden has to offer." After a recent stay at 21 Broad, this Indianapolis-based influencer says not only do "the pops of yellow decor welcome you into what feels like an island home living room," but the "staff make you feel as though you're long lost friends." This Boston-based travel and lifestyle maven describes The Merchant as a "funky boutique hotel that has an old New England feel with a modern vibe." After a recent solo lark to Camden, this Boston-based influencer calls Whitehall "an adorable inn loaded with charm and stylish & cozy corners." These Boston-based influencers describe Blue – Inn on the Beach as a "truly magical" location and suggest the perfect way to enjoy this spot is by "sitting on the inn’s lounge chairs or bringing some of their cozy beach chairs down by the water." Following a recent visit to Newport, this New York City-based influencer says "there could not be a more idyllic New England spot than The Attwater." Following a recent stay at 21 Broad, this Chicago-based blogger says "what really sets 21 Broad apart are the design and amenities," and the impeccable service. This New York City-based influencer describes The Hotel Portsmouth and Lark Hotels as "cozy, incredibly well styled, always run by a great team and in the most charming towns in the US." This fashion and lifestyle influencer describes Gilded as a "one of a kind boutique hotel full of life" with "ornate mirrors, lacquered surfaces, and gold accents." Following a girls weekend in Kennebunkport, this Rhode Island-based influencer describes Captain Fairfield Inn as being "meticulously decorated, all while maintaining its "historic charm." After a recent trip to Martha's Vineyard, this Rhode Island-based influencer described The Christopher as "an An Edgartown charmer," while she called Summercamp a "personality packed" property. This Pittsburgh-based influencer describes her stay at 21 Broad as both relaxing and enjoyable, highlighting the decor, amenities, and welcoming staff. This New York-based blogger calls The Merchant "unbelievably unique with one-of-a-kind decor." In this article highlighting Stowe's thriving culinary scene, Field Guide's onsite restaurant, Picnic Social, is featured for its unique and varying menu, which includes item like smoked trout toast and a signature cocktail, the Pickwick Social. This Boston-based blogger calls Captain Fairfield Inn "the cutest bed & breakfast I’ve ever experienced." This Boston-based blogger calls Captain Fairfield Inn a "mix of modern elements with classic pieces." Written by two sisters, this Boston-based blog calls Captain Fairfield Inn "a beautiful mix of historical charm and updated style" and notes Kennebunkport's accessibility from the Boston area. This photography blog featured The Christopher calling it "breezy and tropical, yet distinctly New England." This Newburyport-based blogger calls her recent mother-daughter getaway at Captain Fairfield Inn a special treat, naming the small plate breakfast spread as a highlight of the overnight. Calling Captain Fairfield Inn "part classic and part modern...with mind-blowing decor" this Boston-area influencer was especially bowled over by the "farm-to-table style breakfast and freshly baked sea-salt cookies laid out each afternoon." During her recent stay at Field Guide, this Manhattan-based blogger described the hotel's thoughtful decor as the "epitome of mountain-chic" and noted its perfect location. After a recent getaway weekend to Stowe, this East Coast influencer calls Field Guide a quiet and cozy place for a perfect weekend retreat, complete with a "delicious in-house restaurant, Picnic Social, with decor that seamlessly syncs with the rest of the lobby." During a recent staycation, this Rhode Island-based influencer describes Gilded as a "snazzy updated oasis...with breakfast that would have made Martha (Stewart) herself proud!" This Boston-based influencer describes Field Guide as a "total feast for the eyes" and raves not only about the "beautifully curated selection of breakfast treats" but Picnic Social's "mouth-watering, juicy" burger, as well as the great cocktail and beer menu. This DIY-focused influencer describes the rooms at the Captain Fairfield Inn as each having "its own personality...with decor that is unmatched." But the most impressive part of her stay? The breakfast frittata, "only explained by emojis." This Boston-based blogger raves about Gilded's "beautiful breakfast spread" and the hotel's technological leanings. During an early winter stay, this style maven describes Blue–Inn on the Beach as "breathtaking even in the quiet of winter." During her recent stay at Blue Door Group, this San Francisco-based influencer notes that she "loved the amazing amount of natural light and the interior design style" and "you really will not want to venture out of the house– it’s so adorable and welcoming." During a recent winter weekend at Blue—Inn on the Beach, Meaghan Murray from The Stopover had the opportunity to try dishes from a variety of Lark Hotel restaurants. She called it "most delicious way to experience the Lark Hotel brand." Calling her recent weekend on Plum Island an "I’ll-remember-it-forever kind of getaway," this Boston-based blogger suggests a stay at Blue—Inn on the Beach to beat the winter blues. This Boston-based jetsetter calls Blue–Inn on the Beach "the epitome of a beach house, gorgeously located right on the water with sweeping ocean views...in short, a weekend getaway dream." During her recent winter staycation, this Boston-based blogger was in "complete awe" from the moment she arrived. From the inviting in-room fireplace to the stunning views, Blue—Inn on the Beach offered all of "those beachy vibes" she was looking for and more. From "the crystal chandeliers to the polka dot carpets, lush plant life covering the grounds, and of course the swoon-worthy pool and hot tub nested among lemon trees," it was love at first sight when this color aficionado arrived at White House for a Napa getaway. In pursuit of the perfect Stowe-cation, this island-based influencer made sure to pop into Field Guide's onsite restaurant, Picnic Social, to sample the small plates cuisine. One of her fellow travelers notes, "it was the best meal I've ever had." After a long day on the slopes, this Rhode Island-based influencer was "excited to head back to the suite at Field Guide, which overlooked town with its own porch, separate living room, fireplace and cozy king bed." On a lark at The Attwater to celebrate her birthday, this Boston influencer was wowed by the hotel's colorful design, location, and amenities. According to this San Francisco tastemaker, her stay at White House "was even more fun than I could have imagined. The room was spacious, beautifully appointed, and had great views from the balcony, plus Apple TV, iPads with preloaded apps of activities and restaurants, bluetooth speakers, and extremely comfortable beds." West Coast influencer Stacie Flinner chose Captain Fairfield Inn's Lark Suite for her home base during a recent East Coast swing. From the "bold, punchy color grounded by antique persian rugs and oil paintings...to the most glorious small plates breakfast, this boutique hotel was the perfect place to hole up for a few days." While the babymoon concept has gained more popularity in the last few years, this Boston-based blogger found a lack of resources when searching for easily-accessible destinations. So naturally, she created the ultimate New England babymoon guide herself, focusing Lark locales such as Whitehall in Camden, The Attwater and Gilded in Newport, Field Guide in Stowe, 21 Broad on Nantucket, and The Break in Narragansett. On a quick lark while touring New England, this Florida-based fashion influencer found her stylish match in the Vineyard Vines suite, cafe, and courtyard at 76 Main. After a late October stay at 21 Broad, this well-traveled influencer is convinced that Nantucket should be on everyone's go-to fall destination short list. The luxurious decor, cozy outdoor courtyard, and delicious breakfast make 76 Main the perfect centrally-located home base for a quick trip to Nantucket. "With its hand painted wallpaper, high ceilings, and colorful prints and textures throughout," notes this Texas-based influencer on her baby moon, "Pomegranate Inn is an art lovers' paradise...I felt like I was on vacation in the world’s largest (and most amazing) dollhouse." After researching New England destinations for a babymoon, this Boston lifestyle influencer settled on a stay at 21 Broad on Nantucket. She notes that "the cozy beds, delicious chocolate fudge brownies upon arrival, board games in the lounge, and tapas-style breakfast contributed to a feeling of complete and utter relaxation." Whitehall serves as home base for exploring Camden in this travel diary by the Rhode Island-based influencer behind Prosecco & Plaid. Salt Lake City-based family blogger Blissful in Blue came to Stowe with her little family in tow and was bowled over by Field Guide's family friendly touches and "above and beyond" customer service. Upon her arrival at Blue Door Group's JD House, this San Francisco-based influencer remarked that her room was "the trifecta: a deep soaking tub, a pot-bellied stove and a balcony with views of the Pacific." This Boston-based blogger and lover of color can personally confirm that Nantucket is an ideal fall getaway, and 21 Broad's "cozy, yet chic boutique hotel with its crisp, clean modern decor" is the perfect home base for island exploration. For her first visit to Portsmouth, this fashion blogger chose The Hotel Portsmouth and its "historical vibe with modern flair" for her home base for stylish exploration. This NYC-based fashion influencer described her room at The Hotel Portsmouth as a cross between a tree house and modern loft, commenting that it "was the most unique hotel room I have ever stayed in." During a recent trip to Kennebunkport, this Connecticut-based fashion influencer notes that the general managers "enthusiasm, warm welcome, and exceptional service" are the perfect match for Captain Fairfield Inn's chic decor and central location. "When you walk through the front door of Captain Fairfield Inn you truly do feel like you are walking into the comfort of your own home, but with the modern amenities of a hotel," notes NYC-based fashion influencer Styled Snapshots. On the final stop of her New England tour, this Chicago-based fashion influencer made the most of The Attwater's prime location, outdoor patio with comfortable seating, complimentary breakfast in the morning, and sweets throughout the day." From the beautifully appointed room to the impeccable service and prime location, Chicago-based fashion blogger Style Charade gives 21 Broad a stylishly rave review. Chicago-based fashion blogger Style Charade notes that "between the elegantly appointed décor, central location, and extra amenities," Captain Fairfield Inn is the perfect place to stay for a Kennebunkport adventure. From the design to the amenities to the location, this New York-based blogger found her ideal island vacation base at 21 Broad. This New York City based blogger highlights everything from Summercamp's beautiful veranda, plush linens, retro vibe, and nostalgic decor following a recent girls' trip to the Vineyard. Following her recent stay at Summercamp, this fashion influencer notes that the hotel's "interior design is something to marvel...every single detail is well-curated and thought out, with little touches throughout that create a playful, vibrant atmosphere." This Boston-based travel and lifestyle photographer says Summercamp "may reflect retro camp vibes...but the open-concept and tasteful decor makes it the ultimate getaway on the Vineyard." Upon entering Field Guide's "stunning space of white, and birch, orange" with her family in tow, all this Boston-area blogger had to say was "whoah." NYC fashion maven Katie's Bliss chose 21 Broad as "the perfectly chic and well-situated spot for exploring Nantucket." Boston-based travel and food blogger J.Q. Louise noted, "There is really only one place for the discerning traveller in Stowe, and that is the chic new Field Guide." This Charlotte, NC-based interior designer and blogger devoted a Wanderlust Wednesday post to the "insanely chic" interiors at our newly renovated Edgartown hotel, The Christopher. New York-based blogger Simply Cyn and Gilded made a colorful match during her early spring stay in Newport. This popular Boston lifestyle blogger deemed Gilded the place to stay in Newport, stating "everything about Gilded, from the freshly baked cookies to the interior design put a huge smile on my face." This North Shore style blogger and stylist chose The Merchant for a fashion photo shoot, stating,"Once we got in the door, we were totally blown away by the spectacular decor. The hotel is funky, modern, and has pizzaz." Boston's daily guide reviewed The Merchant and raved, "I travel often and our getaway to The Merchant really resonated with me. The best part? The incredible bed! The sheets were so soft, the pillows just right – it was such a treat." Captain Fairfield Inn was featured in this top New England blogger's post on a romantic getaway to Kennebunkport, Maine. This popular New England seacoast, travel blogger loved The Merchant, stating, "I was truly blown away. The bright, colorful decor and historic charm welcomed us to a sweet and comfortable home away from home." Field Guide was featured in the popular lifestyle blog Love Taza as the place the stay in Stowe, Vermont. She loved our cute (and tasty!) breakfast baskets. The Attwater was featured as a top place to stay on this popular travel blog’s article on Newport. Ale House Inn was profiled as the place to stay in Portsmouth, NH, in Daily Candy’s recent overview of the town as a New England getaway destination. Photographs of 76 Main and the work of our designer, Rachel Reider, were profiled in this popular design blog. 76 Main was featured in a Father’s Day gift guide article in Daily Candy Boston. Captain Fairfield Inn is profiled in this travel blog’s write-up, One Day Stay: Kennebunkport. The Attwater was featured in this travel blog’s “great escapes” write-up on Newport, RI. With 32 rooms and suites, The Hotel Portsmouth joins the Ale House Inn as Lark Hotels' second Portsmouth property. Lark Hotels is is heading west to Northern California with the addition of the Blue Door Group – Inns of Mendocino. The Sydney, a stylish and intimately sized boutique hotel nestled in the heart of Edgartown, MA on Martha's Vineyard, will feature eight guest rooms. Take advantage of this great grand opening deal at Whitehall in Camden, Maine. Gilded opening in Newport, RI as Lark Hotels' second property in this gorgeous seaside town. Boutique Hotel to feature signature restaurant, Pig + Poet, a collaboration with nationally acclaimed chef, Sam Talbot. Our Award-winning Newport RI hotel announces new suites and rooms at the Urban Beach House. A second hotel on Nantucket will feature 27 rooms and unique luxuries. Introducing the vineyard vines Suites! Lark Hotels Teams with vineyard vines to unveil designer suites on Nantucket and Kennebunkport. New Properties in Portland, Maine and Nantucket Added, Narragansett Announced for 2014. Six-Month Winter/Early Spring Food-Lovers Getaway Series in Kennebunkport. Lark Hotels Launches New, Three-Location “Wanderlark” Package. Introducing Newport’s Newest Boutique Hotel. Al Roker and Travel + Leisure include 76 Main and The Attwater in a segment on getaways from Boston on "Wake Up with Al," a Weather Channel program. On this episode of the Today Show, a stay at 76 Main and Nantucket's Christmas Stroll are profiled as the perfect way to celebrate the holidays. On this episode of the Today Show, The Atwater is featured as the "fun, super-funky" boutique hotel destination in newport RI. In search of the ideal Maine getaway, Chronicle profiled the Pomegranate Inn as the perfect place to stay while exploring the ins and outs of Portland. Gilded made the top of the short list in this segment featuring summer vacation destinations that won't break the bank. The Chew TV show interviewing Chef Sam Talbot about Pig + Poet, our new restaurant at Whitehall in Camden, Maine. Field Guide is featured in this Al Roker-hosted segment about great Labor Day getaways. In a segment of reasons why Salem is more than just a Halloween destination, Chronicle profiled The Merchant, calling it a charming boutique hotel and highlighting the George Washington Suite. In this segment on the boutique hotel business, Lark's CEO Rob Blood talks about what today's guests are looking for in their travel experience and the seasonal rhythm of hospitality. Blue–Inn on the Beach was featured in a “What’s New” segment, highlighting the view from its signature suite and proximity to the beautiful beaches of Plum Island.